One might think: Come on, it’s just water. It flows freely from your tap. And yet millions of Americans each year opt for bottled brands instead. Cynics claim all water’s the same, but there are real scientific reasons that you may favor one bottle over another. From subtle mineral flavors to quirky taste bud chemistry, there is more under the cap than you think. 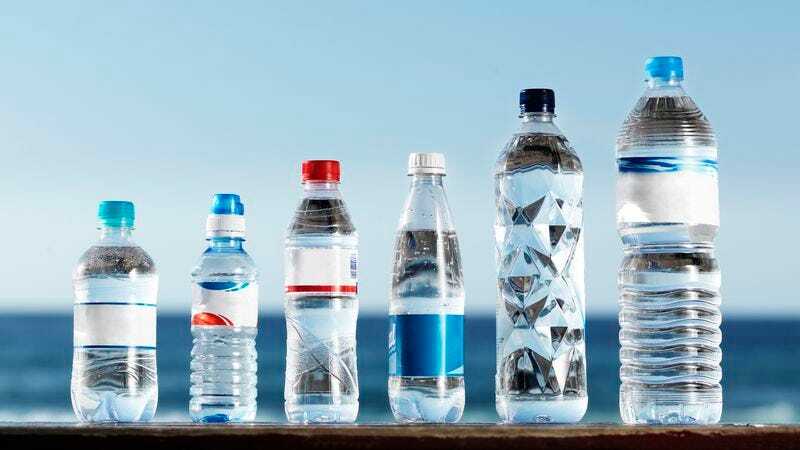 Most bottled drinking water falls into one of two categories: water from natural sources (typically sold with minimal or no filtering) and water from municipal sources (typically filtered and treated). Water pulled from deep within the Earth might not be contaminated by pesky humans, but that isn’t to say it’s 100 percent H20 either. By bubbling up through rock or flowing over sand, water inevitably picks up minerals, salts, and gases from its journey that stay dissolved until you pop the top. Even rainwater collected in the remotest parts of the world far from polluted city centers can carry a nasty history with it. On the other hand, bottled waters pulled from municipal sources—which include big names like Aquafina and Dasani—start with normal tap water, but achieve their so-called purity through filtration processes such as reverse osmosis (where pressure differences force water to flow through one-way membrane filters from high concentration solutions to lower ones, leaving the dissolved solids behind) or distillation (where water is boiled and collected, leaving behind the unwanted solids). Though one would expect this water—which can be made more pure than 200-year-old iceberg juice—is what should go in the bottle, flavor engineers take that neutral canvas and add minerals and salts back in to make bespoke water-by-design. Why do they sully such a good thing? It turns out that those dissolved solids are essential to tricking our bodies into thinking water tastes “good.” Dissolved minerals affect a water’s pH (how acidic or basic it is), whether it is hard or soft, and its alkalinity. Though none of this sounds especially appetizing, your most basic senses of taste are just chemical reactions that measure these properties. Consider the water that you encounter most often: your own spit. Each person’s saliva is different, but healthy spittle is salty and laced with whatever cocktail of proteins, enzymes, and chemicals your body determines is essential. This decidedly un-pure concoction is what you “drink” all day, and it sets the standard against which all other water is judged. If your spit is slightly acidic, for example, a more basic glass of water (say one tinged with baking soda) will seem sweet. Or if you’ve just finished eating something salty, a salt-free chaser (say a shot of distilled water) will strike you as bitter. Positive ions—like the sodium of table salt, but also potassium and magnesium—bind with the taste buds for “salty” and “bitter” in different proportions, and send signals to our brain that we decode as flavors. Our receptors for “sour” effectively measure acidity (which is related to certain ion concentrations), while our receptors for “sweet” can be tricked by some basic solutions. If you’re surprised to hear about these chemical compounds in your water, it’s because they’re rarely advertised in this way. Instead, dissolved ions are collectively called “electrolytes,” and these electric charge carriers do more than activate taste buds. Electrolytes keep the cellular processes that control your body running smoothly, and regulate the flow of fluid into and out of tissues. They control muscle contractions, allow neuron transmission, and maintain blood pressure. We get some electrolytes from the food we eat and its breakdown as we digest, but most of our necessary ions come straight from water. While those bottled waters aren’t so “pure” after all, surely scientists can surely make something untainted in a lab, right? Yes… but you probably don’t want to drink it. The standard in scientific research labs is some version of highly purified water (HPW). Usually made on site (since transportation or long-term storage risks contamination), the highest grades of HPW contain less than 100 parts per billion of any dissolved solids, a thousand times less than the “purest” bottled brands. HPW might be doubly distilled (boiled, separating water steam from the solid residue), doubly deionized (treated with resins that remove or replace unwanted ions), sterilized (blasted with ultraviolet light or heated to kill bacteria), or ultrafiltered (passed through engineered membranes that trap particles). Regardless, the result is water that’s great for scientists who want to be sure they’re not contaminating reactions or biasing test results, but isn’t really suitable to drink. Since most of our body functions are regulated chemically by electrolytes, drinking ion-free water risks pushing our body’s balance out of whack. HPW acts as an ion sponge that steals electrolytes from anywhere it can. This means that in extreme cases—that is, if you drank enough—HPW would leach water out of some cells, while causing others to absorb too much. The result could be burst cells and even tissue death. Even just placing your hand in a bucket of high purity water would be memorable; as the HPW drained your skin of potassium, magnesium and sodium, you’d feel a strong drying sensation despite the otherwise very wet circumstances. In the end, then, we should be grateful for that little bit extra we find in our “pure” bottled water. Be it natural or engineered, our taste and health depend on it.